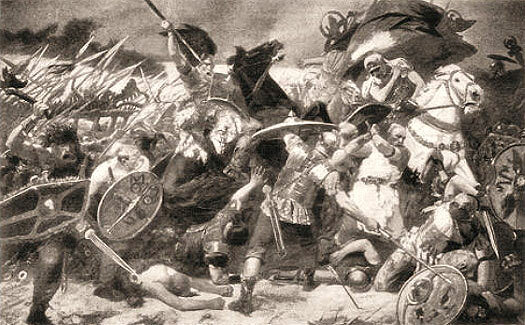 Although they are frequently listed as a Germanic tribe, the Lemovii (Lemovier in modern German) were clearly Celtic. By the first century BC they were a relatively small group that was occupying territory in the valley of the Viadus (the modern Oder), near the Baltic coastline, with the Germanic Rugii to their east, the Burgundiones to the south, and the Langobards to the west. After the Latin suffix has been removed, the tribe's name breaks down into a core element - 'lem' (lemos). This 'lemos', is not listed in the proto-Celtic dictionary, but the similar 'limos' is an elm. The modern Welsh form is 'llwyfen', although the modern 'f' was an 'm' before the sound shifted during the sixth to eighth centuries AD. The name seems to refer to a traditional link with the elm tree, probably with their settlement being located close to an elm grove used for religious purposes. Only then would this make sense (prestige-wise) as a tribal name. The Lemovices name is very similar, provoking some to link the two tribes together. The tribe was recorded only by Tacitus, but single instances of reference such as this are not at all uncommon. It suggests either a tribe that appeared briefly, perhaps as a sub-group or splinter, and perhaps then due to Celtic fragmentation caused by increasing German superiority, or that they were a remnant of a once larger tribe that was in the process of fading out of existence. In all probability, they ceased to exist by the start of the second century AD, subsumed within larger and more powerful German tribes. The Oxhöft culture first appears in the region around the southern Baltic coast, succeeding the previous Pomeranian culture in modern northern Poland, mainly around the mouths of the Oder and Vistula. New arrivals in the form of a migration seem to create the culture, or bring elements of it with them. These people are probably either Scandinavians, or from the western-neighbouring Jastorf culture, but the Celtic Lemovii seem to drift into its sphere of influence in the process of becoming Germanised. Writing around this time, the Roman writer Tacitus mentions the Suevi, listing their constituent tribes which cover the larger part of Germania. Clearly in the century and-a-half since their first appearance on the Rhine they have expanded considerably. They comprise the Langobards, the Semnones ('oldest and noblest of the Suebi'), 'the seven tribes of Jutland and Holstein': the Angles, Aviones, Eudoses, Nuitones, Reudigni, Suardones, and Warini, then the Hermunduri on the Elbe, three tribes along the Danube, Marcomanni, Naristi, and Quadi, followed by the Buri and Marsigni. Then there is a mountain range that separates part of the Suebi, beyond which, along the Vistula, are the constituent tribes of the Lugii, the Harii, Helisii, Helveconae, Manimi, and Naharvali. Then come the Cotini (or Gotini, as Tacitus calls them), Gutones (the Cotini again, although perhaps a subdivision of them), Lemovii, and Rugii along the Baltic Sea, the various divisions of the Suiones (Swedes), and last but not least the non-Germanic Aestii, and beyond them the Sitones, both of which are on the Baltic coast. Noted for their custom of twisting their hair and binding it up in a knot (known as the Suebian knot), the Rugii live close to the Gutones and Lemovii, along the Baltic Sea. They, along with the Goths and Lemovii, carry short stabbing swords and round shields. This all suggests that the Lemovii have already become Germans in all but name.